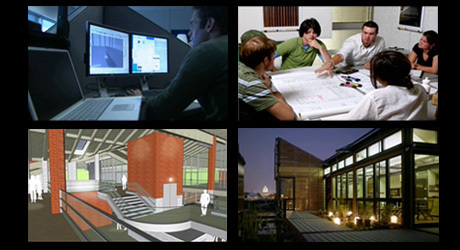 Just past its first birthday, the Department of Visualization at Texas A&M’s College of Architecture continued its growth with the January 2009 approval of its first undergraduate degree program, a Bachelor of Science in Visualization, by the Texas Higher Education Coordinating Board. The degree will be offered for the first time in fall 2009. "Now, the word needs to get out", said Tim McLaughlin, head of the department. "That’s our biggest challenge right now, saying ‘Hey! We exist!’"
Screen shots from a new video highlighting the five research centers and the Visualization Laboratory at the College of Architecture. The Texas A&M College of Architecture’s five formally organized research centers and its Visualization Laboratory are featured in a new video, produced with funds provided by members of the Dean’s Advisory Council for the college. One of the premier design research institutions in the world and the largest college of its kind in the United States, the Texas A&M College of Architecture, through its research centers, strives to improving the knowledge base of the planning, design, construction professions. Oscar Muñoz, deputy director for the College of Architecture’s Center for Housing and Urban Development, introduces a video examining Texas A&M’s role in providing water filters for colonia residents in Texas. The Center’s Colonias program implements solutions that reduce the isolation of the impoverished residents of colonias along the Texas-Mexico border and helps them become full participants in the U.S. economy and society. “Imagine half-a-million people that do not have utilities, do not have paved roads, that do not have housing that’s up to code,” said Muñoz in the video. Valerian Miranda, associate professor of architecture at Texas A&M’s College of Architecture, has been named director of the college’s CRS Center for Leadership and Management in the Design and Construction Industry, thusly continuing a relationship that began 25 years ago when Miranda went to work for the center’s famous founding firm, CRS. Prior to his appointment, Miranda had served as interim director of the CRS Center since September 2008. He began his professional career at the CRS firm in 1984 after receiving a master’s degree from Texas A&M. In 1991, he returned to College Station as the college’s first Bill Caudill Research Fellow. Caudill, and John Rowlett, former Texas A&M architecture professors, were the founding members of CRS. In 1948, Wallie Scott, Caudill’s former student, joined the partnership. 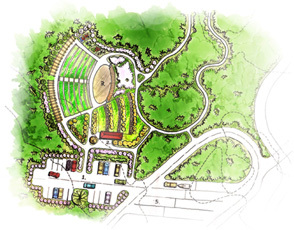 The awards keep rolling in for a parkland design near Spring, Texas by graduate and undergraduate students led by Jon Rodiek, professor of landscape architecture at Texas A&M’s College of Architecture. With the March 15 application deadline looming, 25 individuals have so far applied for the open dean’s post at the Texas A&M College of Architecture, according to a March 2 communiqué to college faculty and staff from Luis Cifuentes, interim vice provost and chair of the 17-member dean search committee. Cifuentes said the committee is in the process of reviewing the applications and will soon identify and interview the semi-finalists. The schedule, he said, calls for campus visits from the finalists in May and submission of a recommendation for dean to Jeffrey Vitter, Texas A&M provost and executive vice president for academics, by May 29. Candidate applications are welcome until the March 15 deadline. A job description and details for applying are available online at http://deansearch.arch.tamu.edu/. Jun-Hyun Kim, a Ph.D. candidate in the Urban and Regional Science program at Texas A&M’s College of Architecture, is studying the effects of landscape spatial patterns on the physical activities of Hispanic children in Houston’s East End through a $20,000 grant from the Robert Wood Johnson Foundation. Kim’s one-year study, “The Role of Landscape Spatial Patterns on Physical Activity: Does the Landscape Structure of Urban Forests Promote Physical Activity, Walking, and the Quality of Life of Hispanic Children?” will focus on research subjects living in an area bordered by Interstate 45 on the west, Highway 59 on the south, Loop 610 on the east, and an east-west line south of Interstate 10. Vaibhav Malhotra, a student in the Master of Science in Construction Management program at Texas A&M’s College of Architecture, was awarded The University of Salford Pro-Vice Chancellor Prize for Best Paper in Research & Innovation at the Built and Human Environment International Postgraduate Research Conference 2009. The Jan. 29-30 conference at The Lowry in Greater Manchester, U.K., was attended by Malhotra, Jose Fernandez-Solis, assistant professor of construction science at Texas A&M, and Rohan Jawali, who is also pursuing a Master of Science in Construction Management degree. Malhotra’s paper, “Identification of Strategies & Challenges of Decentralized Alternative Energy Source for Reduced CO2 Emissions in the Mercantile Sector," was one of 74 papers shortlisted by the conference’s International Scientific Committee for presentation and inclusion in a conference publication. To facilitate a long overdue redesign of its website, the College of Architecture at Texas A&M University has set up an online survey to gather input from current and former students, as well as faculty, staff and friends of the college. “Because information gathered from this survey will inform the new design, we strongly encourage the thoughtful participation of the website audience, whether they are casual visitors or daily users,” said Phillip Rollfing, director of communications for the college. The survey, which is broken into categories for current and former students, faculty and staff and friends of the college, can be accessed online at http://archone.tamu.edu/College/News/2009/Surveys.html. Note: Some survey participants may encounter a notice concerning an invalid or untrusted security certificate. Please accept the certificate or add an exception to proceed. Sam Brody, acting director of the Texas A&M College of Architecture’s Hazard Reduction & Recovery Center, talked about the center’s humble beginnings and dynamic growth during a March 3 interview on “Homeland Security Inside & Out,” a weekly radio show hosted by David McIntyre, director of the Integrative Center for Homeland Security at Texas A&M. The center, celebrating its 20th anniversary in 2009, began with one person in a closet-sized office, said Brody. “Twenty years later, we’ve got about $4.5 million of external funding, 8 core faculty, 2 research units, two graduate certificates and 2 research labs that house about 25 students,” he said. To listen to Brody’s segment on the show, click here. Rosalva Gonzalez's model of “The Cove,” a proposed rehabilitation camp for disabled veterans and their families. Gonzalez and other architecture-for-health students unveiled their design concepts for the facility Feb. 16. Students in two Texas A&M architecture-for-health studios recently teamed up with a former NASCAR driver to design facilities for a rehabilitation camp in Virginia created especially for disabled veterans and their families. The veterans’ camp, know as “The Cove,” will provide opportunities for hunting, camping, canoeing and other outdoor activities. The project is being undertaken by the Ward Burton Wildlife Foundation, an organization founded by Ward Burton, a 17-year veteran of the NASCAR circuit and winner of the 2002 Daytona 500. Students collaborate during a design charette at Aggie Workshop 2009, which also featured speakers, roundtable discussions, and other activities. Luminary speakers, design charettes and roundtable discussions highlighted Aggie Workshop 2009, the annual three-day conference organized and hosted by the Texas A&M student chapter of the American Society of Landscape Architects. The 2009 Aggie Workshop, held Feb. 19-21 at the Langford Architecture Center on the Texas A&M campus, marked the 34th consecutive year for the event. David Yocca, a principal with the Conservation Design Forum, an Elmhurst, Ill. firm specializing in integrated water-based ecological design delivered the keynote address. Yocca talked about fundamental ecological design principles, historic ecosystems, and how they worked before the arrival of Europeans in the West, as well as the impact of conventional design practices and why they’re unsustainable. Chris Hays, right, and the group gaze at the site. 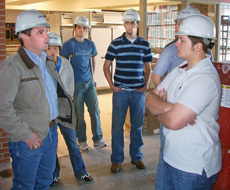 Students in Julian Kang’s spring 2009 Building Information Modeling class at Texas A&M’s College of Architecture are learning firsthand about Building Information Modeling (BIM) through a partnership with Satterfield & Pontikes Construction, Inc. The Houston-based firm is the general contractor at the Texas A&M Health Science Center, under construction on state highway 47 west of Bryan. Competition teams from the Department of Construction Science at Texas A&M’s College of Architecture fared well at the Associated Schools of Construction’s annual competition Feb. 7-9 in Dallas. In the design/build team, consisting of Aaron DiFilippo, Adeel Mitha, Andrew Darnell, Carlos Ramirez; and John DiFilippo captured first-place honors. The team was coached by Boong Ryoo, assistant professor of construction science. Turning in a third-place finish in the commercial building division was a team consisting of Brian Massey, Brooks Herman, Cheri Chen, Michael Knapp, Nick Pirro, Troy Louwerse and alternate Kristian Jonsson. Sally Morgan, Debra Ellis and George Eustace, senior lecturers in the Department of Construction Science, coached the team. They were also assisted by team sponsor, Joeris General Contractors, Inc. of San Antonio. Pictured: Robbie Klekar, left, a project manager with Joeris General Contractors, talks with construction science competition team members Cheri Chen, Michael Knapp, Troy Louwerse, Brian Massey and Brooks Herman. Assistant lecturer Paolo Piscitelli settles his work, "In Between the Lines", in its new home in front of the Langford Architecture Center’s C building. A reception for the artist is scheduled 3 p.m. Tuesday, March 24 adjacent to the sculpture. From inside and outside of his newly installed sculpture, “In Between the Lines,” artist Paolo Piscitelli, an assistant lecturer in Texas A&M’s Department of Visualization, has provided new views in front of Building C of the Langford Architecture Center. Piscitelli created the sculpture at the college’s Architecture Ranch at Texas A&M’s Riverside Campus as part of its spring 2008 Artist-in-Residence program. He made the piece to help him experience what at the time was a new landscape for him: the Brazos Valley of Texas. 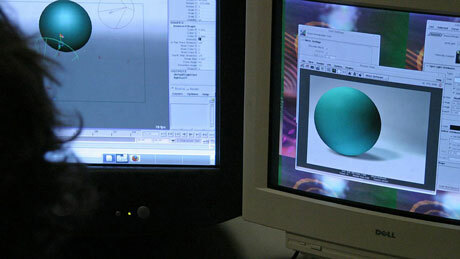 The Department of Visualization at Texas A&M’s College of Architecture is forging into the future with the help of its Visualization Industry Partners (VIP), an advisory board consisting of computer animation, simulation, architecture and gaming firms on the cutting edge of the use of computer graphics for visualization. “This is an extremely fast moving field,” said department head Tim McLaughlin. “Our visualization partners provide feedback from the industry about the way the program is operating, what our graduates are doing, and how we can direct our research and teaching in ways the that fit with industry’s vision of the future,” he said. Pictured: 'Viz' student Donald Fong shows his work to Jeffrey Katzenberg, CEO of DreamWorks SKG, during a previous visit to Texas A&M. DreamWorks is one of the charter members of the Visualization Industry Partners, a visualization department advisory group. At a Feb. 20-21 showcase for a select group of digital media luminaries from throughout Texas, the Department of Visualization at Texas A&M University highlighted its current programs and future plans in the realm of digital media and contemporary art. The event, “Art 2.0,” provided approximately 30 participants, including designers, artists, art dealers and curators, with an opportunity to view student and faculty work and comment on department initiatives. “It was an effort to let a small, select group know what we’re doing, and provide lots of opportunities for feedback,” said Karen Hillier, professor of visualization. 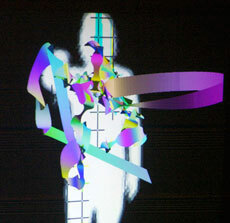 Pictured: Guests used a Wii Remote to create art with MS Viz student Gracie Arenas’ interactive installation. Charul Mehta, a master of architecture student, carefully works on a seed post. Michele Brody, the first of three artists to come to the Texas A&M College of Architecture during the spring 2009 semester’s Artist in Residence program, worked with students to build two seed post installations, now sprouting greenery along the elevated breezeway between Langford builds A and B.
Brody’s work, such as the seed post project, which was part of her “Green Environments” workshop, endeavors to make viewers more aware of the relationship between themselves, nature, and the urban environment. Upcoming Artists in Residence visits include in March the San Francisco-based Rebar Group, followed by an April visit from Philadelphia artist Jenny Sabin. “Path,” left, and “Alone,” photos by Ivan Farr, helped him earn top honors in an International Education Week photo contest. It was a clean sweep for senior Bachelor of Environmental Design major Ivan Farr, whose photographs placed first, second and third in a photo contest commemorating International Education Week sponsored by the Alpha Eta Chapter of Phi Beta Delta and the Borlaug Institute for International Agriculture. Farr’s work will be on display at “Higher Ground,” a mixed media art exhibit at the Wright Gallery March 23-27. Farr will talk about his work during a reception at the gallery at 7 p.m. March 23. Graduate students at Texas A&M’s College of Architecture turned in 23 abstracts, nine papers and made nine presentations in a research competition sponsored by the Aggie Postgraduate Built Environment Research Chapter of the International Council for Research and Innovation in Building Construction. It was the newly endorsed chapter’s first such event, which took place March 4 in building C at the Langford Architecture Center. Aggie basketball player Andrew Darko, a construction science major at Texas A&M’s College of Architecture, told Brad Cox of Big12Sports.com he wants to stay in the sports world once his collegiate playing days are over by building athletic facilities. Joe Horlen, head of the Department of Construction Science at Texas A&M, is among a select group of top faculty at Texas A&M, Prairie View A&M University and Texas A&M University-Kingsville who are recipients of the first-ever Teaching Excellence Awards, a student-selected honors program launched last fall by The Texas A&M University System. “This distinct honor is expressly designed to allow students to recognize those teachers who go above and beyond the typical expectations to deliver a first-rate education. We truly appreciate everything you’ve done,” said a letter of congratulations to faculty winners from the Student-Led Awards for Teaching Excellence. Forster Ndubisi, head of the Department of Landscape Architecture and Urban Planning at Texas A&M’s College of Architecture, has accepted an invitation to serve in two capacities at the Landscape Architecture Foundation. Ndubisi will be serving as the foundation’s vice president for information and research and as a member of its executive committee. Four former students of Texas A&M’s College of Architecture have been elected to membership in the American Institute of Architects’ College of Fellows for their significant contributions to the profession. Geoffrey Brune, ’96, Donna Kacmar ’88 and ’92, James Kirkpatrick ’69 and ’76 and Nancy McCoy ’81 (pictured above, left to right) now await May 1 investiture ceremonies at Grace Cathedral in San Francisco during the 2009 AIA national convention. In a press release announcing the new Fellows, the AIA says "the Fellowship program was developed to elevate those architects who have made a significant contribution to architecture and society, and who have achieved a standard of excellence in the profession. Election to fellowship not only recognizes the achievements of architects as individuals, but also their significant contribution to architecture and society on a national level." Texas A&M’s College of Architecture is now accepting nominations to honor its former students, who have emerged as leaders and top contributors in their respective fields, as Outstanding Alumni of the college. In a recent letter, Jorge Vanegas, interim dean of the college urged alumni to "nominate exceptional former students who have demonstrated the highest standards of integrity and character, and significantly contributed to the professions and industries engaged in the natural, built, and virtual environments." Nominations must be received by May 4, and honorees will be officially recognized at an awards banquet this fall. Keith Klohn, a former visualization student at Texas A&M's College of Architecture, and a team of animators from Pixar were recognized at the 7th Annual Visual Effects Society Awards for their work in the animated feature film, "WALL·E." Klohn and three other Pixar animators were named winners in the Outstanding Effects Animation in an Animated Feature Motion Picture category at the VES Awards, held Feb. 21 at the Hyatt Regency Century Plaza Hotel in Los Angeles. "The recipients exemplify true excellence in the field of visual and special effects," said Eric Roth, VES executive director. "On behalf of the VES board of directors, I congratulate all of this year’s nominees on their incredible work." On Oscar night in Los Angeles, "WALL·E" director Andrew Stanton accepted a gold statuette for his movie’s being named best Animated Feature Film. Working behind the scenes to make the science fiction flick an Oscar-worthy masterpiece were 17 graduates and four current students from the masters program in visualization science at Texas A&M University, part of the Department of Visualization at the university’s College of Architecture. "The Viz Lab and Pixar have had a relationship for more than 10 years now," said Tim McLaughlin, head of the Department of Visualization. "The evidence of the strength of that relationship shows as the names of former students roll across the screen at the end of "WALL·E."" Ronald J. Gafford, an Outstanding Alumnus of Texas A&M’s College of Architecture, has been promoted to chairman, president and chief executive officer at Dallas-based Austin Industries, one of the largest, most diversified construction companies in the nation. Gafford, who received a Bachelor of Building Construction degree from Texas A&M’s College of Architecture in 1972, replaces William T. “Bill” Solomon, who retired after more than 45 years with the company. “Ron Gafford has demonstrated through his role as president and CEO that he will make an exceptionally fine chairman and will lead the company to new levels of accomplishment,” said Solomon. Los Angeles-based Kelly Architects, headed by firm president George Kelly, a 1986 Bachelor of Environmental Design graduate from Texas A&M’s College of Architecture, won two prizes at the 2008 American Institute of Architects’ Restaurant Design Awards. The firm won the Award for Excellence in Restaurant Design and the People’s Choice Award for their work at Osteria Mozza, a new Italian food restaurant in Hollywood. The College of Architecture Biennial Faculty Art Show runs March 26 - May 31 at the Memorial Student Center’s Stark Galleries. 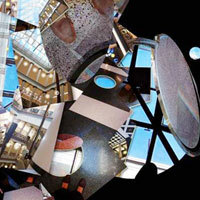 An opening reception with exhibiting artists is scheduled 6:30 p.m. Thursday, March 26. Two local museums are featuring the paintings and drawings of Robert Schiffhauer, associate professor of architecture at Texas A&M’s College of Architecture. “The Brazos County African-American Museum is displaying 40 of Schiffhauer’s portraits of prominent figures in African-American history and his favorite president, Abraham Lincoln, through March 31. “Schiffhauer wanted to tell this story, of the men and women, black and white, free and slave, who lived during the tumultuous era that he said set the course that led to the steps of the Capitol, where the nation's first black president took the oath of office last month,” wrote the Bryan Eagle’s Vimal Patel in its Feb. 15 issue. Reception for “Higher Ground” — A reception on the opening day of Ivan Farr’s exhibit “Higher Ground” will take place in the Wright Gallery, building A in the Langford Architecture Center, at 7 p.m. This night only, some very special works of art will be on display. These special pieces include paintings, photographs and sculptures. For more information, contact Ivan Farr at 979.422.9359 or ivanfarr1@gmail.com. “Higher Ground,” a mixed-media exhibit by Ivan Farr, will be on display in the Wright Gallery, building A in the Langford Architecture Center. Ivan is a senior at the College of Architecture majoring in environmental design and minoring in architectural history. He uses various media to explore and express his creativity, particularly via painting and photography. Ivan draws on the memories and dreams of his Eastern European childhood for inspiration. The concept of the show is based on Ivan’s use of art as an escape from the hassles of life. All the work to be displayed at the exhibit is original and has been finished outside academia. For more information, contact Ivan Farr at 979.422.9359 or ivanfarr1@gmail.com. Maroon is Green Earth Day Fair: The three student groups kicked off the Maroon is Green Sustainable College Initiative last year are planning a second big Earth Day event on April 22 at the Langford Architecture Center. Planning for the event is still under way, but tentative plans call for another Eco Fair in the Langford A atrium, speakers, outdoor activities and an Eco-Art exhibit featuring artwork rendered from recycled material. For more information or to contribute, contact Trisha Gottschalk, 979.845.2030 or trishag@tamu.edu. 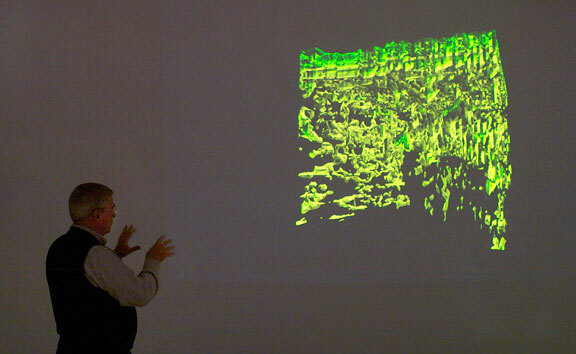 Fred Parke, professor of visualization, explains an image from “Atta Texana Leafcutting Ant Colony: a View Underground,” an immersive, three-dimensional representation of an ant colony which he created with Carol LaFayette, associate professor of visualization. The demonstration was part of Art 2.0 on Feb. 20 and 21, in which the Department of Visualization hosted a small, select group of people throughout the state influential in digital media to get feedback on its programs and initiatives. .